As we begin the new fiscal year, I’ve received questions about whether NIGMS plans to continue its diversity supplement program. The answer is a definite yes. We remain committed to this program, which addresses the important goal of increasing the diversity of the biomedical and behavioral workforce by providing supplemental support for research experiences and mentorship for students and fellows at a range of levels, from high school through postdoctoral training. Diversity supplement requests may be submitted throughout the year and are reviewed within NIGMS on a rolling basis. Applicants should be aware that the program is competitive and we only fund meritorious applications that meet the program’s goals. For more information, visit our diversity supplement Web site, which we have recently updated to reinforce the NIGMS philosophy for the program and to clarify eligibility and application requirements. In addition, we have added frequently asked questions and answers. Before submitting an application, I suggest that you contact either your program director or me at zatzm@nigms.nih.gov or 301-594-3833. I’ve been a program officer for NIGMS research and training activities for 27 years. The Molecular Biology of the Cell journal recently asked me to describe the general roles of such a position, including the challenges and rewards. My essay , which appeared in the August 1 issue, offers insight into what the job entails and how we can help our applicants and grantees. This essay is written from my perspective as a program officer for research and training activities at the National Institute of General Medical Sciences (NIGMS) for almost 27 yr. It gives a bird’s-eye view of the job of a program officer, which includes providing advice to applicants and grantees, making funding recommendations, overseeing grantees’ progress, facilitating scientific opportunities in specific areas of program responsibility, and shaping NIGMS and National Institutes of Health (NIH) policy. I have highlighted the numerous rewards of serving as a program officer, as well as some of the difficulties. For those who may be considering a position as an NIH program officer now or in the future, I’ve also described the qualities and qualifications that are important for such a career choice. Finally, this essay addresses some of the challenges for the NIH and the research community in the years ahead as we simultaneously face exciting scientific opportunities and tighter budgets. The next deadline for NIGMS grantees to apply for our administrative Supplements for Collaborative Science program is May 15, 2010. As I mentioned in an earlier post, this program helps grantees form new collaborations that enhance their NIGMS-funded research efforts. A collaboration may, for example, let a grantee follow up on an exciting, unanticipated discovery or take advantage of recent progress in his or her field. If you are interested in applying for a collaborative supplement, please contact me, Susan Haynes or your program director. 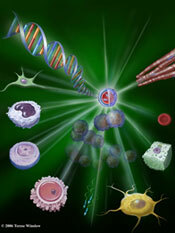 Human embryonic stem cell research is an area of special interest to NIGMS. It represents a unique opportunity to explore the most fundamental mechanisms of biology and development while providing a foundation for future clinical applications. 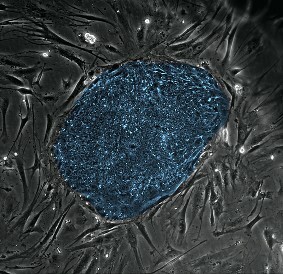 NIGMS’s support of basic research in embryonic stem cell biology is actually greater than that of any other component of NIH. As part of our continuing commitment to this research area, we hosted our third workshop that brought together 54 NIGMS grantees working on human embryonic stem cells. Each workshop helps them exchange ideas and pursue collaborations while informing us about their progress and challenges. The research presented during the talks and poster session at this year’s meeting covered a broad array of topics, reflecting the most up-to-date (and unpublished) work from labs across the country. It was wonderful to see how much progress has been made since the previous workshop two years ago! Sessions focused specifically on advances that help us understand how cells self-renew, how and when differentiation occurs and what directs cell fates. Another session discussed technological developments, such as large-scale culture techniques and the application of cutting-edge approaches in proteomics, glycoproteomics and global mapping of chromosomal interactions. Grantees also shared their latest progress on induced pluripotent stem cells and genetic reprogramming. After listening to the presentations, it became clear to me that one of the pivotal directions for future stem cell research is going to be epigenetics, especially as it relates to regulating pluripotency, directing cell fate and inducing genetic reprogramming. Several talks, for instance, showed how two different but genetically similar human embryonic stem cell lines give rise to distinct cell types under the same conditions, presumably due to pre-existing epigenetic marks. Since the last meeting in 2007, we’ve seen the remarkable development of human induced pluripotent stem cells. But as Jamie Thomson suggested in the closing session, we won’t be able to decipher critical differences between these cells and human embryonic stem cells until we really understand the range of variability in both types of cells. Given the accelerating pace of progress, I expect that future research will generate many new insights and perhaps some surprises that we’ll hear about in the next two years. We’ve modified the receipt dates for our administrative supplement program Supplements for Collaborative Science (SCS), which helps grantees form new collaborations that enhance their NIGMS-funded research efforts. There will be only two submission deadlines in 2010: January 15 and May 15. All other details of the program remain the same. If you’re a grantee interested in applying for an SCS supplement, please read the entire NIH Guide notice and contact your program director to discuss your plans. Before her retirement in January 2015, Marion managed grants involving research on cell cycle control, programmed cell death and stem cells as well as predoctoral training grants in cellular, molecular and biochemical sciences and molecular medicine. She also administered NIGMS’ Diversity and Career Re-entry Supplements program.